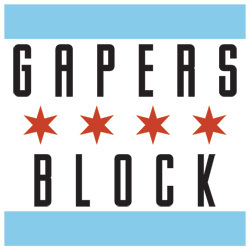 As we previewed last week, the second annual Record Store Day rolled through Chicago's independent merchants of music, and a whole gaggle of Transmission staffers headed out into the beautiful spring weather to score some deals, and celebrate the day. I started my day off at Hard Boiled Records in Roscoe Village. Not as well-traveled as Reckless or even Laurie's up the street, I thought I could try out a new store (for me) and score a hit at the same time by obtaining one of the few Thrill Jockey LP special in the city. Unfortunately, when I entered the shop and asked about the album, I was told they were already out. What I overheard the owner say next, however, to another new customer was that the shop had let its regulars stake claim to the special orders the store had obtained, so there was actually very little for the average record enthusiast just checking out the place. In my opinion, this was completely antithetical to the inspiration for Record Store day, and while I browsed for a few other albums on my list, I just didn't feel very welcome in the store. Sadly, I left. Meeting up with friends, I then visited Dead Wax near Lincoln and Grace where I quickly scored some nice finds in the dollar bins (which were plentiful), including the soundtrack to How the West Was Won (with original songs by Debbie Reynolds), Duran Duran Notorious, Air Supply Now and Forever, Tammy Wynette's Greatest Hits, a kooky '80s album by Digital Cowboy titled Our Daughters Wedding and Paul Simon self-titled album for $2.99. Plus, after briefly scanning the 50 cent table I picked up an Aretha Franklin 45 with "Son of a Preacher Man" and "Call Me". The store was brisk, with lots of people buying everything from discounted VHS tapes to albums (even with their kids in tow — kids who actually knew what albums are!). 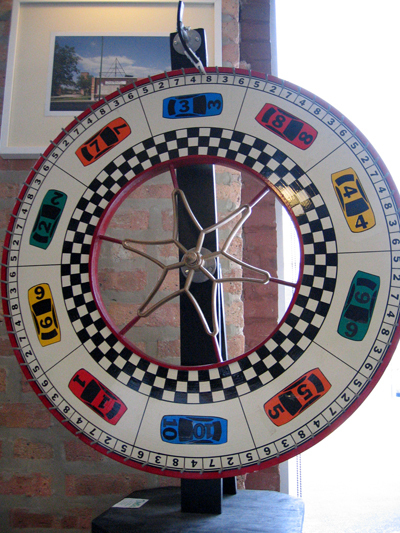 The next stop, now that we'd picked up some momentum, was at Dusty Groove, where the festive atmosphere was apparent with a wheel of prizes to be spun with purchases, and free popcorn for all. The soul was flowing freely over the speakers and I enjoyed perusing the aisles. I actually got a Roy Ayers album I'd been thinking about (one of many by the singer they had in house, including the soundtrack to Pam Grier's movie Coffey). The one I found is titled Everybody Loves The Sunshine and if that yellow cover doesn't cheer your mood, the sultry tunes sure make you want to boogie. I also got a very awesome copy of Al Green Gets Next to You. 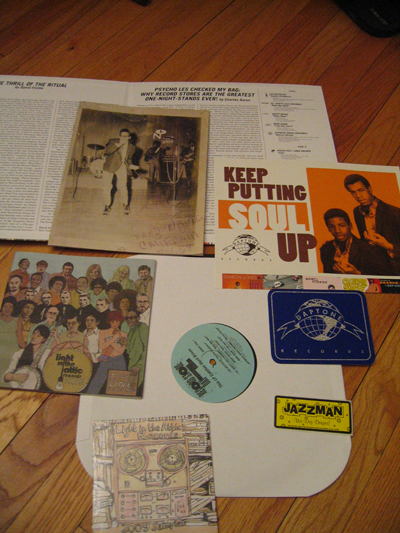 The special Record Store Day release album I bought actually proved to be chock full of surprises — including not only a swell various artist LP titled This LP Crashes Hard Drives, but also a mix CD by Light in the Attic Records (Austin, TX), a Light in the Attic Records zine, a mini poster, a sparkly Daptone records sticker, a Jazzman Records (UK) sticker and a Numero Group catalogue — all for $10. After spinning the wheel, I also obtained a nice split 7" by The Whigs and We Are Scientists. The last stop was at Permanent Records where we hit the store right before the experimental cellist Helen Money started her set. At this point I started hitting up the CD racks as well as the vinyl. I got a fine used copy of a Wesley Willis greatest hits album ("Rock and Roll McDonalds"! ), a John Zorn Filmworks CD (El General) and another used gem, Mos Def Black on Both Sides. I also picked up The Flying Burrito Bros The Gilded Palace of Sin, an album I'd wanted since seeing their Nudie suits in person at the Country Music Hall of Fame a few years ago. They were out of goody bags of free swag, but the clerk took the time to check on the location in the store of a CD for me (the latest from The Whitest Boy Alive titled Rules — sadly, they were out), and everybody was in pretty great spirits, even with a lot of folks browsing the tight aisles. First, a swing-through to Dr. Wax in Hyde Park, where I meet up with fellow GB contributor Troy Hunter as we doubled up on hitting a couple of participating spots. Some browsing, some back-and-forth over certain items and artists that we happen across, a few minor temptations, but no great yields there aside from my own way-belated hardcopy grab of Pharoahe Monche's last album. Otherwise, I think we're saving it for the next stop — Jazz Record Mart — where the coveting (and budgeting) business will no doubt be running deep. This time out, I wasn't aimlessly browsing. I'd come with a wantlist of stuff I was looking for, mostly old New Orleans r'n'b/funk jawns — stuff by the likes of Eddie Bo, Lee Dorsey, or maybe that Wild Tchoupitoulas album that's always evaded my grasp. No haps of any of it aside from a bunch of bases I've already got covered. Troy's off combing the jazz CD bins while I'm over in the vinyl bins. Three quarters in the Chi parking meter later, I have a stack of stuff I'm carrying around, and soon enough it's decision time. Ahmed Abdul-Mailk, Here Comes Shuggie Otis, The Watts Prophets, and that rare David Axelrod joint will have to wait for another time. I end up going home with Señor Soul's It's Your Thing, a proper vinyl copy of the Mississippi Records anthology Life is a Problem, as well as a long-overdue copy of Terry Callier's What Color Is Love in the 12" format — which is worth having for the suitable-for-framing cover art alone. The line at the counter's pretty long. Cashing out, I ask one of the dudes behind the counter how RSD09 has been treating them. Very good, he tells me, they've been busy. "It's funny," the other employee chimes in, "Last year it was practically nothing, but this time we've's definitely seen an increase in traffic." Different from the usual clientele? "Oh, yeah -— totally. It's been nice." I'm a music collector. Even if there weren't a retailer's holiday like Record Store Day, I'd probably still spend many hours and dollars at record shops on the third Saturday of April. 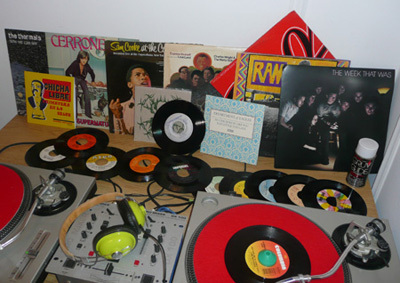 But just in the last two years, the concept of Record Store Day has ignited shoppers. 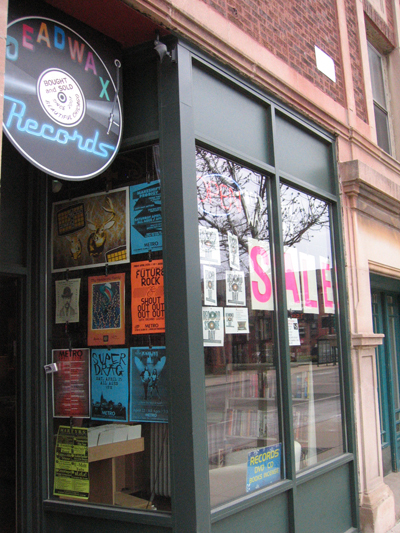 People are actually talking about record shopping outside of record shops. The special releases and free swag are incentives for both the regular shoppers and those who use Rapidshare and that ilk for all of their music. At the Old School in Forest Park, it looked like business as usual. Around 1PM, there were no more ten people flipping through the bins. Although there was a good amount of chatter, whether about a funny-looking album cover or how a band was at a show. The discounts weren't as extensive as at Permanent, but it didn't deter buyers too much. 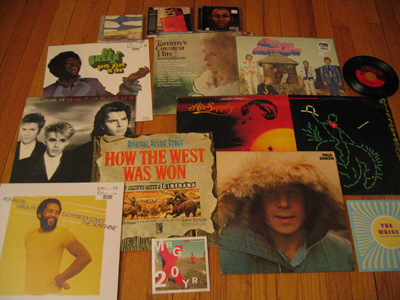 And it was clear that at least two people near me were not regular record store patrons. Maybe they just decided to visit a record store for a change, but I'd like to think they were there because of Record Store Day. Beverly Records celebrated with discounts and food. The Bulls/Celtics game was on in the background and conversation was dominated by either that game or the evening's Flames/Blackhawks tussle. But a handful of people dug through their stacks like it was their job and walked out with piles of records. It's not exactly Brooklyn's The Thing, but it might as well be Chicago's answer because any thorough look reaps surprising rewards. Record Store Day still has a few kinks to work out. But it's definitely on the right track. And with more support in the next few years, stores that understand how to run it with respect to all customers will be the ones benefiting most. I'll be looking forward to it. But, really, I can't even wait next week when I end up in a record store again. I never grew up with a local record store in my hometown. We only had a book and music exchange, filled with dusty copies of Top 40 hits of yesteryear. Outside the exotic visit to a record store while on vacation, I didn't have the music haven of a record store until I moved to Chicago for college. 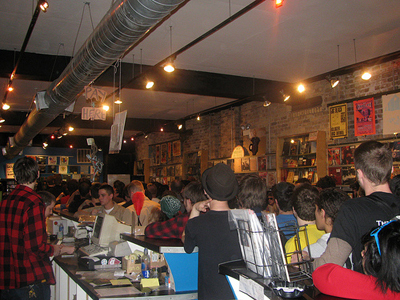 One of the first places I went to in the city was Reckless Records on Milwaukee. It was exactly the type of place I needed for so many years in my life, and everything felt so familiar when I entered. Although I get my fix at numerous shops now, I had to return to my first record store in Chicago to celebrate Record Store Day. I entered Reckless to the sounds of The Lawrence Arms and their surprise in-store performance, making me feel like a pop-punk high school kid all over again. There is something totally different about pouring through records while listening to live music as oppose to the music the staff picks to play. The store was packed, and thankfully I planned ahead and made a list of the some of the exclusive Record Store Day releases I wanted to purchase. Sadly they only had the Thrill Jockey compilation still in stock, and I was lucky enough to grab the last one. I talked to one of the guys behind the counter, and he said many of the split 7 inches I was hoping to pick up were already marked up and going for sale on eBay. Which was a sad state of affairs for such a joyous event, but nothing new in the world of import, exclusives, or small pressing vinyl trading. I left with a few new albums, and couldn't wait to rip open my purchases, a far cry from my feeling of joy when I buy an mp3 or compact disc. As I read the awesome package of essays from store owners or musicians of their personal favorite record stores that came with the Thrill Jockey release on my bus ride home, I realized that this day maybe chalked full of nostalgia and even a bit silly when you realize you should be shopping at these stores all year and not just one day, but there was no better place to be on a Saturday afternoon. And Reckless Records, just like it did the first time I set foot in the store, felt just like home. My Record Store Day started at Hard Boiled where there, honestly, wasn't much going on. Just a guy behind the counter and a couple loiterers — no sign of anything special happening on this day. 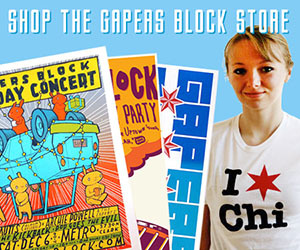 We moved on to Reckless Records on Milwaukee Ave where there was a lot more activity. Lots of shoppers in the store, album cover caricatures, and preparation for live acts to perform later. Next, we walked on to Dusty Groove and Permanent Records. 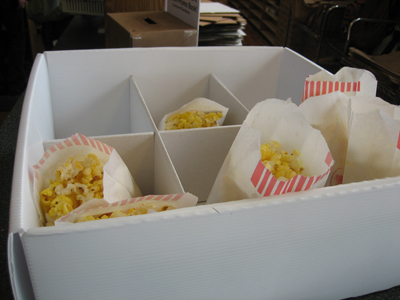 Dusty had popcorn for everyone, and the Numero Group DJs were playing the tunes. We popped in and out of Permanent, feeling a little exhausted, then headed to lunch. If you wanted to get your share of the special RSD releases though, most of the stores were sold out of the most popular items by the time we got there. Your best bet would have been to go to our last stop, Reckless on Madison where we picked up our only loot of the day: The Flaming Lips/Black Keys Borderline 7" and Wilco's Ashes of American Flags DVD (which came with tons of mp3 bonus downloads). We also noticed that those 7"s that were still available at Permanent earlier, were marked up to almost twice the price that they were at Reckless. I'd say Record Store Day was a success for getting people in the stores again, but how long they can sustain customers is unsure in this in the day of internet sales and file sharing. Some of the appeal of "scoring" that special album, or special RSD release is lost in this age though, because you know in the back of your mind you can most likely download it, or if you're into having the physical copy, you know you could probably find it on Ebay or Craigslist. It was a fun event though for running into friends, seeing the same people from store to store — a community event. And while it may be easier to find and purchase mp3s on the internet, it is good to have human interaction with people who have shared interests that is missed from living behind your computer screen. Yeah, that 70 degree weather helped in making the day a success too. I went into Record Store Day on a budget, so I was focused on finding two specific RSD releases — the Sonic Youth/Beck Pay No Mind 7" and the Jenny Lewis/Elvis Costello "Carpet Baggers"/"Go Away" 7". I started the day at Reckless Records on Broadway. To my disappointment, they didn't have a Record Store Day display and I couldn't find any RSD releases in their regular shelving. I walked up to the counter to ask if they had any RSD releases, when I overheard a boy asking the same question, to which a Reckless employee didn't seem to know the answer. I walked out with nothing, and it was a total bummer. You wouldn't even have been able to tell it was Record Store Day at all in there, save for two posters hanging in the back. I'd be interested to hear if I just got there at a bad time and other people were able to score some gems at this location. 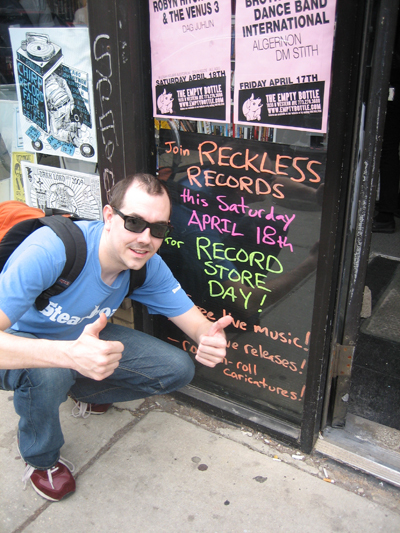 I then scooted my way over to the Reckless in Wicker Park for the Lawrence Arms in-store. It was packed! Plus a lot of kids were fighting their way through the crowd to make it to the counter to buy some music. It was a great vibe, and we ended up sticking around for half an hour. Sadly it looked like all of their Record Store Day releases were on a shelf in the middle of the store, which would have taken me light years to get to in that crowd, so I again left with nothing. Determined to actually buy music on Record Store Day, we then headed up to Laurie's Planet of Sound in Lincoln Square. They didn't seem to have gotten many of the Record Store Day releases to begin with, and at that point all they had left were a few records in a box behind the counter. I did score the Decemberists "The Rake's Song"/"East India Lanes" 7", my first purchase of the day. My last stop was Dave's Records in Lincoln Park. Why didn't I go here first? This was my favorite stop of the day. The records were well-organized, the Record Store Day releases had their own shelf in the back, and Dave was super friendly. Sadly, it didn't look like they carried my sought-after Jenny Lewis/Elvis Costello 7", and he was already sold out of the Sonic Youth/Beck 7". I did end up making a few purchases here - the Lykke Li/El Perro Del Mar RSD 7" and the Black Kids Wizard of Ahhhs 10", plus the non-Record Store Day release Siamese Dream 12" by The Smashing Pumpkins, which I for some reason didn't already own on vinyl, and a new Ben Kweller 7" from Bloodshot Records. 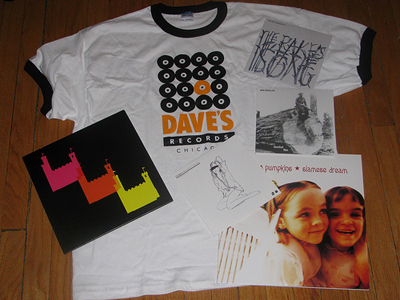 Dave threw in a sweet Dave's Records t-shirt as well. Next year I am making this store my first stop. I didn't end up with either of the releases I was looking for, but I still found a few gems regardless. I'd say it was a successful Record Store Day. [See all of Stephanie's photos here]. In defense of the bigger stores (like Reckless) not having a special Record Store Day section or putting the releases in the regular shelving, I don't think that would have been the most practical approach for them. I was a the Milwaukee Reckless shortly after 10:00, and there was a line of about 25 people (and growing) who were pretty much just after the RSD releases. Everyone had a list anyway. Keeping the special releases behind the counter where the staff could control them made sense in their case. Throw it all out of the floor and there probably would have been a riot :). For what it's worth, they actually did put the sleeves in the regular shelving, but that was actually probably a bad idea - while I was there they had to go and find the person who had the sleeve for the Pavement live LP since someone who was ahead in line had just requested the last copy. Most of these special releases sold out within the first hour at most places, so setting things up in the traditional "browse" model wouldn't have been very practical. Andrew - this feature was just about Record Store Day. I also spent some cash at CHIRP this weekend, and was happy to chat with folks who came by the GB table on Sunday! Glad you had a record-filled weekend! Heh, I scored the Thrill Jockey long player and the Pavement live LP, but that was in Montana where the buyer is kind and lines are short. What about Rolling Stone up near the HIP? We went there, got the new WILCO dvd and enjoyed a nice instore by the Company of Thieves. Someone care about the north north side? Aw man, I wish I would've known Company of Thieves was doing an in-store. I would have stopped by for sure. KMCD - I love Rolling Stone, but it's WAY off the beat path for most of us inner-city hipsters :). It's kind of hard for folks who live East/near the lake to get to. Plus, I didn't think they carried that much vinyl. Has that changed? I'm A radio D.J. and after ny radio show i always remind listeners to surport the record stores because they're slowly but surly dissapearing.